Summer vacation is fast approaching and coming up with activities to occupy the kids each day can be difficult…and can get expensive. Kids are usually pretty easy to entertain and there are many places to take them that are really cheap, if not free. On days when the weather is not cooperating, it is nice to have activities for them to do at home as well. Every time you receive a paycheck put $5 or $10 aside in a jar for summer fun time and use that money for activities throughout the summer. Below are a few budget friendly ideas on how to entertain the kids during summer break. 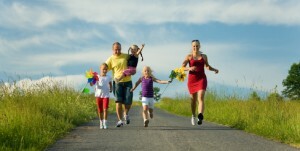 USFamilyGuide.com is a great place to find fun and cheap activities for the kids in my area. All you have to do is choose your location and options will come up for you to research. Playgrounds, National Parks, free bowling and $1 movies and the local zoo have been favorites of many kids during the summer months. Throughout your area there should be numerous public playgrounds for the kids to utilize. Set up a rotation of playgrounds to visit each week so the kids do not get bored quickly and that will give them a chance to burn off some energy. Make a day of it and bring some sandwiches, a blanket and snacks so you can have a little lunch in the grass. National Parks are great for hiking and sightseeing. This is also a chance to teach children about nature, create a scavenger hunt where they have to spot certain animals, leaves and trees to make the trip more fun for them! This can be done easily on the computer and just print the list out so they can check off their findings as you walk along. Free summer bowling programs were available in the past so check out your local bowling places online to see if they/when they may be offering that program again for the kids. In the past it was a voucher for two free games of bowling and free shoe rental for school aged children. Some local movie theaters may offer programs during the summer where school aged children could attend a matinee for only $1. It is best to check out the local movie theater websites to see if they are offering a summer program. It may be one day each week where the kids can see a movie for only $1 per person, so that is a reasonably priced activity. If they want candy, take them to The Dollar Store before heading over to the movie, they have movie theater candy boxes for only $1! The local zoo is a reasonably priced place to take the kids as well, and if you live near museums check and see if there are discounts for children during the summer months. The zoo may offer an annual membership; you could purchase a membership and take the kids every week for the summer if you wish. The cost of a membership is usually paid off in three or four visits! There are so many places to go, definitely check online with your local news stations too, as they may have a section of local attractions and entertainment that may be beneficial. A few kid favorites include watching movies, playing video games, coloring, playing with play-doh, and building with household objects. If you have a gaming system, you can connect it to your Wi-Fi and rent movies through Netflix via the gaming system. You can also watch movies on the movies on demand channels if you have cable. Some movies are free and other range from $.99 – $3.99 each and it will be added on to your cable bill. Video games are fun, however, playing in moderation is recommended. Video games will fulfill some down time for kids, and they actually alleviate stress, so giving kids a few hours each day to unwind with a video game is something fun for them and is a great way for parents to relax too. Coloring is fun and builds fine motor skills in children so that is always a plus too. Get some free computer paper from Staples when they have their rewards deal on paper and get a pack of crayons so the kids can get creative! Play-doh can be made with 2 cups flour, 2 cups warm water, 1 cup salt, 2 Tablespoons vegetable oil and food coloring. The making process can be fun as well; the kids will feel gratification that they actually made their own Play-doh! The ingredients are reasonably priced too so this is definitely a fun activity that the kids will enjoy and have fun with. Kids love to build and they can use their creativity by creating play forts with items around the house. Pillows, blankets and the use of bins or a table can be great for building an indoor hide out! They will use items in your home, and they will use their creativity to figure out how they want to build their hide out. Give them a flashlight and a book and let them read in the hide out for a while! There are so many fun activities for kids to do over the summer, and if you are on a budget, choose wisely. Always remember that kids do not have to cost a lot and that any time you spend with them is fun for them. Take a break and enjoy your time with your kids, whether it is at the movies, watching TV at home, or eating lunch out one day. Nikki Muroski is a mommy of three, a wife and a blogger for her site, Nickel-and-Diming with Nikki. She is also a regular contributor to the CareOne Debt Relief Services blog, a community that provides debt consolidation and money-saving advice.